Salvation And Survival: Courageous or Irresponsible? Whether you agree with her methods or not, one must certainly give Pamela Geller credit for making Sharia law in America come out of the shadows. The outspoken and controversial political activist has been known for her opinions on radical Islam and the politicization of Islam. She has become a tireless spokeswoman against "creeping Sharia" in our country, which has resulted in her being labeled anti-Islamic and Islamophobic by the media and pundits on both sides of the political spectrum. 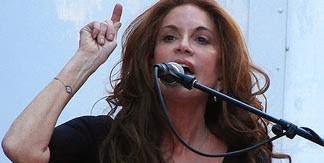 Geller is a Jewish American, and her pro-Israel stance has also made her a target of anti-semitic critics. All that being said, she is not averse to public and heated disagreement when it comes to getting her message across: Sharia law is dangerous, and has no place in the American judicial system. She asserts that Shariah law is different from the theological constructs governing other faiths, claiming that canon law only applies to Catholics and Jewish law only governs Jewish people; she said that Shariah law differs in that it “asserts its authority over non-Muslims” as well. Her continued campaign to shine a spotlight on the dangers of making concessions to Sharia in the name of "tolerance" and "inclusivity" in order to appease radical Muslims, has kept her message on the fringes ... no media pundits or outlets would take her seriously or give her air time to present her views. To be honest, it is tough to applaud her decision to hold a contest mocking the prophet Muhammad. There is no one who would say she didn't expect a violent outcome. And I have heard others remark that there were other ways to achieve her goals. But can you suggest another way that would have forced all the news corporations to cover the fallout of her decision; or that would have forced a discussion of the full ramifications of Sharia Law into the public forum? Is anyone focusing on the fact that two men were compelled to try to kill her, or others, in the name of jihad? Who has not seen or heard radical cleric Anjem Choudary's call for Ms. Geller to be put before a Sharia court and receive the full penalty for facilitating such offensive cartoons, “and if found guilty, of course, she would face capital punishment.” Did you get that? In the United States of America, you have a religious cleric promoting a sentence of death for exercising the right of free speech that this country prizes so much! What a gross misrepresentation of what our justice system is all about! You might think that her methods were crude and in poor taste, but ultimately, she accomplished her goal: pointing out that Islamic Sharia law goes against everything this country stands for. What's more, the mask has been pulled off, and the public has a clear view of how Sharia restricts and obstructs freedom. Then there are those who find her methods too offensive and controversial. And I would dare say that many of our church leaders would shy away from confronting the religion of Islam and Sharia law because they don't want to offend. But by avoiding the subject, do they then lack any credibility and/or influence? Think about Jesus and how He made his point in the public arena! People either loved Him, or loved to hate Him. He wasn't afraid to offend the religious leaders of His day, the Pharisees; nor stand up to the political rule of the Romans. The crowds flocked to Him because of the things He said and did; yet, they also loved to argue with Him and accuse Him of blasphemy and consorting with the Devil. His methods were certainly controversial for the day, and He was a threat to the accepted practices of His time. But He was willing to draw attention to Himself in order to shine a light on truths that needed to be revealed. Now, Pamela Geller is no Savior of the world, but she understands that if you want to be heard, you sometimes have to be willing to be bold, be criticized, and be willing to be misunderstood -- all in order to draw attention to your cause and make people think for themselves. Whether she was courageous or irresponsible, the debate that her event has engendered may well wake up America to the danger that lies within. May God use it for His glory! Yes indeed, she did bring this evil on radical islam out in the open. Whether the American people will wake up to the dangers of islam remains to be seen. How any person can be duped into following this oppressive and murderess ideology is beyond me. Problem is all these immigrants come to America and they want to live and practice their culture in our land but, islam is a whole new ball game. They are bent on the destruction of the American way of life and the nation itself. All this political correctness, multicultural, liberalism, has destroyed Europe. Let it be our example, of our future. Perhaps we need more people like Pamela Geller speaking out on this issue before we have 50 million moslems here. God help us all and open the eyes of the fools in Washington before its to late. Isn't it sad that she has to go to such an extreme to open the eyes of average Americans? It has only been 70 years since the world rejoiced in the defeat of an evil ideology that corrupted the faith of everyday Germans and attempted to destroy a race of people. How can we not see that Satan is utilizing the same plan and tactics today? I fear that all we have to rely on is God's Mercy... Those who are blind are choosing not to see.